Information technology is increasingly being used in pharmacy practice. 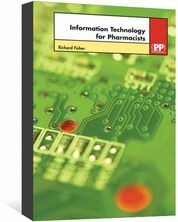 This introductory text will help pharmacists make the most of the information technology they face in their day-to-day working lives. Information Technology for Pharmacists provides a basic understanding of all aspects of computing and how this knowledge can be applied to pharmacy practice. In addition, it gives an overview of electronic information systems and sources relevant to community and hospital pharmacy and covers key issues such as NHSnet, electronic transfer of prescriptions, and electronic patient records and confidentiality. A glossary of computer terms is also included. Written by an IT expert with a background in pharmacy, this book will be useful to community and hospital pharmacists. It will also be valuable to pre-registration trainees, pharmacy students and IT professionals working in healthcare.